Send Me SFMOMA sends artwork corresponding with people's text requests. The San Francisco Museum of Modern Art is putting its vast collection within people's reach — literally. Send Me SFMOMA is a wildly popular creation out of the museum's Lab that encourages people to text 572-51 and get a piece of art delivered directly to their phones. Start the message with "send me" and then keywords, emojis, colors, subjects and feelings are fair game, the museum says. Each reply features an image, its title and date of creation, and the artist's name. The initiative first kicked off with a standard 10-digit phone number, but the SFMOMA quickly hit a roadblock. "The project's beta test began March 31 and ran for four days before the major carriers blacklisted it due to its popularity — they thought we were spamming people with art," a museum spokesperson told NBC Bay Area. 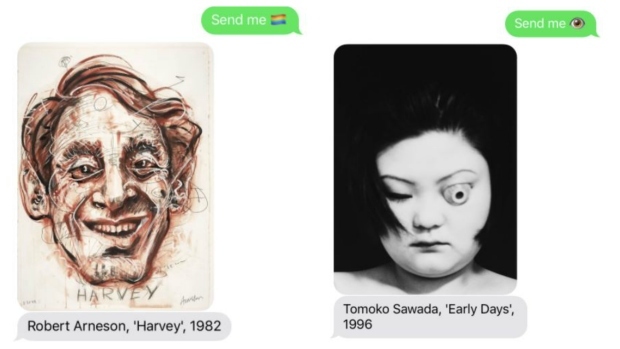 Send Me SFMOMA is a project that allows people to send emojis, keywords or moods to 572-51 and get artwork delivered to their phones. Send Me SFMOMA was officially reintroduced to the public on June 19 — this time with a 5-digit number. "The response to Send Me SFMOMA has been overwhelmingly positive, revealing a deep appetite for art among the public. We’ve responded to over three million texts," according to a museum spokesperson. 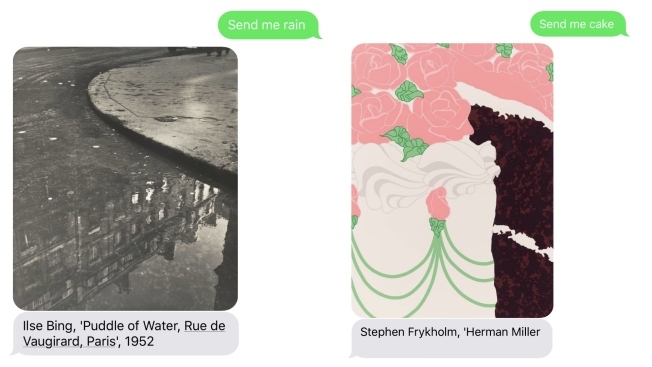 An application program interface powers the text service, creative technologist Jay Mollica told SFist, adding, "SFMOMA has an API that includes metadata for over 30,000 artworks in the collection." Due to space constraints, the museum is only able to display about five percent of its total collection at any given time, TechCrunch reported. "Send Me SFMOMA" is a way for art lovers to dig deeper into the world renowned organization's offerings. Museum officials say they are now mulling expanding Send Me SFMOMA's reach beyond the United States. Text @SFMOMA - they'll send you art. They say they've gotten 2 MILLION texts in 5 days.